Uzbekistan's rating. Shall President Karimov take pride in "accomplishments"? Speaking at the solemn conference dedicated to the 17th anniversary of the Constitution, Uzbek President Islam Karimov gave the local political beau monde chapter and verse on the "reforms on a major scale" under way in the republic and on the astonishing successes of his astute leadership over the previous two decades. "Our country has made colossal progress that is recognized and appreciated all over the world," Karimov plainly stated. He explained that a great deal had to be done yet before Uzbekistan could take it rightful place among the advanced countries and reminded those present of the necessity to "be critical in estimates of what has been done, to beware euphoria, to borrow from other countries' experience and achievements, and to remove with firm resolve the barriers still encountered on the way." 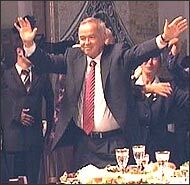 Wrapping up his speech, the Uzbek leader recounted what he thought was behind all this smashing success. "Now that the international community appreciates our achievements and successes on the way to development to a democratic state, civil society, modern economy and to a deserving place in the world, one might wonder what all these accomplishments are based on. They are based on and rooted in our history, cultural and spiritual legacy of the people, its intellectual potential, and capacity for heroic deeds." What successes was Karimov talking about? Who did he warn against being carried away? There is no saying, regrettably. Better to try and consider what the international community really thinks about Uzbekistan with its accomplishments. Fortunately, it presents no problems. Here is a brief update on accomplishments of Uzbekistan. According to the latest Transparency International rating (this is a non-governmental international organization studying corruption the world over), Uzbekistan rates the 174th on the list of 180 countries. Transparency International's CPI Rating (CPI stands for Corruption Perception Index) gauges levels of corruption in different state sectors. TI never misses an opportunity to announce that the CPI below 3 points is crying shame, an indication that the authorities of the country in question refuse to regard corruption as a threat to national security and security of the population or to take measures against it. Uzbekistan's CPI in 2009 was gauged at 1.7. Only six countries in the world (Chad, Iraq, Sudan, Burma, Afghanistan, and Somalia) are worse than Uzbekistan in terms of corruption. Shall we proceed? Karimov referred to "the intellectual potential and capacity for heroic deeds" of the Uzbek people. Let us consider the UNDP (UN Development Program) annual report on the human potential development level in 182 UN members. Where the human potential development index is concerned, Uzbekistan rates the 119th, right after Equatorial Guinea (118th) and before Kyrgyzstan (120th) and Tajikistan (127th) trailed by Namibia (128th). Commendable neighborhood indeed. Intellectual level of the Uzbek population has been declining for years - it was rated once 94th, then 95th, 101st, 107th, 111th, and finally 113th two years running. Degradation is undeniable. The state of affairs with freedom of the media is even worse. Reporters Sans Frontieres rated Uzbekistan the 160th among 175 countries whose press freedom index this organization gauged the last time. Uzbekistan is behind "freedom-loving" countries like Libya (156th), Rwanda (157th), Equatorial Guinea (158th), and Pakistan (159th). Nice company, isn't it? Freedom House's Map of Press Freedom 2009 evaluated freedom of the media (everything from printed to electronic) as well conditions for journalism, degree of state control over the media, economic and political situation in 195 countries. Uzbekistan rated the 189th i.e. among the countries with the least free media. Three Central Asian neighbors Kyrgyzstan (158th), Kazakhstan (169), and Tajikistan (171st) did better than Uzbekistan. It seems that only in Cuba, Erythraea, Libya, Burma, Turkmenistan, and North Korea the situation is worse than it is in Karimov's Uzbekistan. The ease of doing business index annually updated by The World Bank Group is another telling indicator. A high ranking means that conditions for businesses are truly favorable. The lower down the list, however, the harder life becomes for businesses. The 2009 ease of doing business index includes 183 countries and Uzbekistan is the 150th on it. Kyrgyzstan is in the 41st slot, Kazakhstan in the 63rd, Tajikistan in the 152nd. Uzbekistan is followed by African countries with rare exceptions like Haiti (151st), Iraq (153rd), Afghanistan (160th), Bolivia (161st), Lagos (167th), Venezuela (177th), and a couple of island states. Economic freedom index compiled by Heritage Foundation and The Wall Street Journal since 1995 rated Uzbekistan the 148th on the list of 183 countries. The Economist Intelligence Unit (analytical division of The Economist) began rating countries by the Global Peace Index in 2007. As is clear from the title, it is an indicator of countries' peace-loving nature. Of 144 countries on the 2009 index, Uzbekistan rates the 106th. No need to elaborate on where annual reports of Human Rights Watch and Amnesty International place Uzbekistan. Web sites of these organizations are placed off bounds for Internet users in Uzbekistan. What else can be said? Possession of HRW's "Leaden Rain" report on the May 2005 events in Andijan was what journalist and former HRW activist Umida Niyazova was charged with in 2007. Considering other items on the bill of indictment, the journalist was sentenced to seven years imprisonment (an amnesty set her free, eventually). The Uzbek authorities repeatedly deny HRW functionaries accreditation in Uzbekistan using all sorts of pretexts. All of that are what Karimov referred to when elaborating on accomplishments en route to a democratic state and to the rightful place in the world - as well as on appreciation of these achievements by the international community. Are they what one might take pride in?